I had comments but i thought better of it. Fattie might not like them. Interesting post dishy. 1) In many places here, the frank inside a tube is called a French hot dog. Fattie thinks the Swedes shouldn’t take the hit for this – he believes it’s a froggy invention. 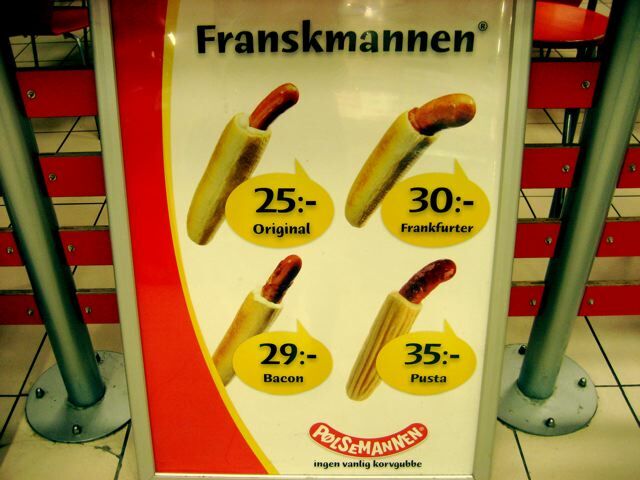 2) The picture attached to this post is actually a danish chain (Polsemannen) and the heading is “Franskmannen”, which means “Frenchman” in Danish. So, it’s very possible I can’t blame credit the Swedes for this monstrosity after-all…..Next time, I’ll do a little more research before popping off! But they still get the nod for the “half & full special”. Yuk. I’m not a fan of the Swedish hot dog either. They’re usually boiled or grilled on those rolly things you see at 7-11 (appropriately nicknamed “1000 milers”) They’re also quite pathetic in terms of being able to fulfill a hunger. You eat one of these and you’re in limbo ’cause you’re full enough to not be starving but not full enough to call it a meal. Give me a good ol’ city/street dog any day! I’m going to have to agree with fattie on this one. At least, it doesn’t look like a far cry from the “hot-dogs” (pronounced ôte-dôg) I see around Paris, especially in the touristy areas. They are usually smothered in cheese, not unlike a croque-monsieur. I always took it to be the French interpretation of what American tourists want to eat. Never seen one covered in mashed potato, shrimp, and cucumenr, though. Anyone who’s into things like that, though, would do well to look into poutine. Went to seoul this weekend and I found a spot that sells those hotdogs wrapped in french fries. It was even more terrifying in person. I didn’t try it because I want to live past 25, but it truly is one of those rare foods that dares you to it. I’ll get a picture next time. Ok – CC – I had to glance at wikipedia for that one. I’ve never heard of poutine. Once I figured out what is is – well, it sounds – well, interesting. S or S – Luv it. I just wonder how the french fries get melded onto (and stay) on the dog….Some type of corn doggish batter, huh? Almost makes me wanna try it…… Almost. Hope you had fun in Seoul! hilarious! can’t say they look appetizing though! on April 30, 2008 at 10:59 am | Reply Tube Steak Madness « sink or schwim. Hey! I’ve had the “full special”… in Swedish, it’s called Tunnbrödsrulle. Had several while I was there on vacation a few years ago. I know it sounds nasty, but let me tell you… it’s AWESOME!!! The regular hot dogs with veetlerk (onion) sauce are amazing, too!